As a brain of the smart home, the Aqara Hub is a control center for an entire smart home. 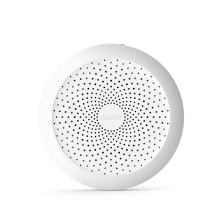 Connecting via Zigbee protocol, Aqara accessories can still work smoothly even if your home network is unstable or disconnected. – Smart Home Center, Aqara Hub connecting via Zigbee protocol is a control center for an entire smart home. – Working with other Aqara smart accessories to create various scenes out of your unlimited imagination. – App Control, with the Mi Home App/Aqara Home app (iOS or Android), works with Apple HomeKit, you can control your home from almost anywhere at any time. – Smart chip, increasing the heat dissipation and ensuring the Hub&apos;s reliability over time. – Voice Control, you can control Aqara accessories with Siri(suitable for iPhone, iPad, Apple Watch or HomePod, iOS devices ), a comfortable home is waiting for you. 1. Please search and download the "Mi Home" APP or Aqara Home app on the Google Play or Apple Store. 2. Only supports 2.4 GHz Wi-Fi network.